Growing up, I always had an advent calendar. Not the kind with gifts OR with chocolate - it was a beautifully elaborate pop-up 3D calendar, with windows that opened to reveal scenes inside. Recently, I've gotten back into all things advent. There are so many BEAUTIFUL ideas out there and I wanted to share some with you for inspiration. Here are a fews of my faves. 1. 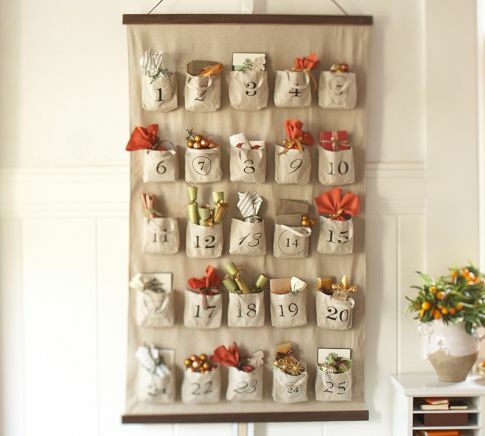 I love, love, love the simplicity of this advent calendar. I think it's so beautiful. Wool felt with rings sewn next to each number, and plain bags or packages pinned on with clothespins. Found on re-nest. 2. This is the advent calendar that I REALLY wanted to make. I love it. In the end, I didn't because once made, it's kind of a large, permanent fixture and we just don't have the storage space. If you have the room, I think this is one of the most fabulous advent calendars I have ever seen! Found on The Painter Family. 3. Simple pouches stamped with the date. Easy to store and could even be hidden in different places around the house for some added fun! Found on Cool Mom Picks. 4. This calendar uses paper pouches and a card tucked into each pouch. Would be great for any scrapbooker or paper crafter out there! Found on Kimberly Peterson. 5. An advent calendar after my own heart. A Christmas BOOK advent calendar! Wrap each book and read that particular story each night. The age appropriateness of the books would change, so I have also heard of people doing this with Christmas books from the library. What do you think? Found on Babyccino Kids. 6. Again, I love the simplicity of this! Can I just fill my house with advent calendars? Would be so simple to make with a painted piece of board, some number stamps and some decorated clothespins. Found on Sunday in bed. 7. If you like paper crafting, this is a beautiful DIY paper triangle advent calendar. There's a free downloadable temple, and folding instructions to make your crafting a little easier! Found on Julie Ree. Last but not least. THIS. This is our current advent calendar! I purchased it from Pottery Barn on sale last year. It's HUGE and I can't wait to be able to use it! 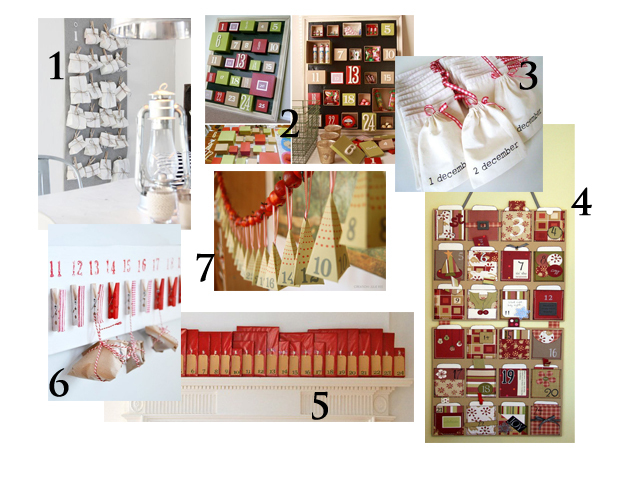 I love the idea of using advent calendars for grown-up gifts as well. Who says you can't make Christmas last the entire month of December? Also, what do you think about the idea of gifting an advent calendar to "kids who have everything"? Bring the advent calendar over at the beginning of December and let them have a month of little surprises - I think it's a great idea. You could do it every year! Tomorrow I am revealing even more great advent calendar inspiration, INCLUDING lot's of creative, inexpensive, and not-so-material ideas for FILLING your advent calendar. oh! and I almost forgot....St. John's Kid shared this advent calendar from L.L. Bean with me recently. Really cute and fairly inexpensive! I love the idea with the books! What a nice way to break out collection of Christmas books, and build anticipation with my children for the next days' read. Thanks. Love the book idea...might have to go on the hunt for some Christmas books as we only have a few already! Thanks! Here's another one for paper crafters using small metal tins.